NBCSN calls their Friday night college hockey game "Friday Night Ice" and it is a huge boost for those who love watching US college hockey as the 2013-2014 season will have more games televised on a national basis than ever before. Between the NBCSN, CBS Sports Network, Big Ten Network, and even the ESPN family there will be games available to watch just about every weekend. For New York Ranger and New York Islander fans it will mean that they will get multiple chances to see their US prospects in action. If the first real night of college hockey is any indication then this will be a very entertaining season. While college hockey was providing plenty of entertainment, it was a WHL defenseman who stole the show as Kyle Burroughs (NYI 2013 7th) earns the first star of the night. 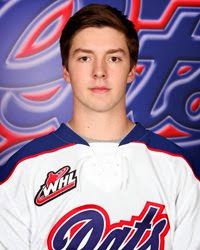 Burroughs had a 4 assist evening which including the primary assist on the game winning goal as his Regina Pats defeated the Vancouver Giants 5-4 in overtime. Burroughs set a new career high in assists while recording his 2nd career 4 point night as the Pats earned their 3rd win of the season (3-5-0-0) and 2nd straight. Vancouver actually jumped out to a 2-0 first period lead before Regina could get on the board. Burroughs got the first of his assists when he set up Dyson Stevenson for a goal at 17:18 of the 1st. It was an even strength goal that cut the lead to 2-1 which is how the game would wind up after the 1st period. In the 2nd, Burroughs would earn secondary assists on 2 Regina goals that would give them the lead. The 1st goal was a power play goal at 8:31 which tied the game at 2-2. The 2nd was an even strength goal at 16:36 which put Regina up 3-2 and Regina would add another goal to end the 2nd period up 2 goals at 4-2. In the 3rd period Regina would let the lead slip away as Vancouver would score to force overtime. In overtime, Burroughs would earn his 4th point and the game's 2nd star when he fed Boston Leier for the game winning goal at 1:57 of overtime. Burroughs doubles his point output for the season as he is now 0-8-8. 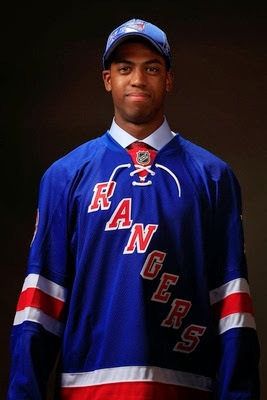 When the game between Anthony Duclair's (NYR 2013 3rd) started, it did not start well for Duclair as he took a goaltender interference penalty just 1:34 in the Rempart's game against the Acadie-Bathurst Titan. Taking bad penalties at the wrong time has hurt Duclair as it affected his play for the entire game. Against the Titan, it had the opposite effect as Duclair would wind up as the game's first star as his Quebec Remparts would shut out the Acadie-Bathurst Titan 3-0. The Remparts wound up down 2 men during Duclair's minor but 12 seconds after Duclair's penalty ended, it would be Duclair scoring his 8th goal of the season at 3:48. It was a shorthanded goal which gave the Remparts a 1-0 lead and because of the shutout would give Duclair his 2nd straight game winning goal. For the game Duclair was 1-0-1 on 2 shots, a +1 with his minor penalty and 2 hits. Robbie Russo (NYI 2011 4th) provided the "dagger" goal as his 8th ranked Notre Dame Fighting Irish opened their 2013-2014 season with a 4-0 shutout of 18th ranked Western Michigan in a game televised on NBCSN. Russo scored a shorthanded empty net goal at 17:36 of the 3rd period for Notre Dame's 4th goal of the game. Russo a junior defenseman had the goal on 3 shots and a +1. His teammate sophomore center Steven Fogarty (NYR 2011 3rd) on paper did nothing but that would be wrong as it was Fogarty who was running the Notre Dame power play that scored 2 of the Notre Dame scored (2 for 9) as the point man. I would like to see some shots from Fogarty but if the Irish are winning he won't complain about his own stats. Adam Tambellini (NYR 2013 3rd) scored his 1st career NCAA goal as his 7th ranked North Dakota hockey team rallied from down 3-1 to defeat Vermont 5-3. Tambellini scored North Dakota's 1st goal of the game just 29 seconds after Vermont had scored the first goal of the game. Tambellini was the starting left wing and was 1-0-1 on 1 shot, even with 2 minors (tripping and high sticking). Adam Pelech (NYI 2012 3rd) had a secondary assist while teammate Troy Donnay (NYR 2013 UFA) recorded his 2nd fight of the season as their Erie Otters defeated the Kitchener Rangers 4-0. For Pelech it was his 4th assist of the season as he is now 1-4-5 as the Otters have won 3 straight to improve to 5-2-1-0. Victor Crus-Rydberg (NYI 2013 5th) returned to the Plymouth Whalers lineup after missing the last 2 game for undisclosed reasons. Crus-Rydberg had a primary assist on Plymouth's 1st goal of the game just 1:43 into the game. It wasn't enough as the Saulte Ste Marie Greyhounds defeated the Whalers 3-2. Cru-Rydberg is now 1-4-5 on the season. In the QMJHL, it was the battle of defensive prospects as Loic Leduc's (NYI 2012 4th) Cape Breton Screaming Eagles looked to earn 2 points on the road against Ryan Grave's (NYR 2013 4th) Charlottetown Islanders. Neither prospect scored although Graves did have 2 shots but it was the Screaming Eagles earning a 3-2 win to improve to 5-3-0-2 while the Islanders fell to 7-2-0-1. Sophomore defenseman Brady Skjei (NYR 2012 1st) and freshman winger Taylor Cammarata (NYI 2013 3rd) made their season debuts as their Minnesota Golden Gophers had little trouble with Mercyhurst shutting them out 6-0 in the opening round of the "Ice Breaker" Tournament. Neither player scored as Skjei took 2 shots and was a +2 while Cammarata took 3 and was even. Freshman defenseman Jake Bischoff (2012 7th) was a health scratch. Ryan Pulock (NYI 2013 1st) returned to the Brandon Wheat King lineup as the Wheat Kings needed the shootout before being able to defeat the Moose Jaw Warriors 3-2. Pulock was scoreless with a slashing minor. Griffin Reinhart (NYI 2012 1st) made his return to the Edmonton Oil King lineup as the Oil Kings defeated the Spokane Chiefs 4-1. Reinhart was scoreless with a roughing minor and a -1 for his evening. Doyle Somerby (NYI 2012 5th) was scoreless on no shots as he made his NCAA debut for the Boston University Terriers as they started their season with a 3-1 win over UMass. If you have not see Somerby, he is a 6'5 225 lb defenseman who looks more like a middle linebacker than hockey player. I want to see him in 3 years when his body matures. Sophomore goalie Stephon Williams had a nightmare of a debut for his 11th ranked Minnesota State Mavericks giving up 5 goals on 22 shots before getting yanked with 12 minutes left in the game. Minnesota State lost 5-1 to the 14th ranked Providence Friars. Just a really bad effort in this game. Freshman goalie Eamon McAdam (NYI 2013 3rd) was DNP in his Penn State Nittany Lions defeated the Army Golden Knights 4-1.